New Effective December 1, 2015 - Elimination of local Gun Boards. A complete copy of the firearm laws for Michigan is available on the Michigan State Police Firearms page or the Michigan Legislature's Firearms page. An Applicant must take a state required training class. Obtain a CPL application at the County Clerk's office, local police agencies or on-line at www.michigan.gov/msp. Applicant must file their application at the County Clerk's office in the County where they reside and must be a resident of that county for at least six months. St. Joseph County residents must apply at the County Clerk's office in Centreville, MI. Office hours are Monday-Friday, 8:00 am to 5:00 pm. A certificate from your training class, must include the State required language. A current photo identification: a Michigan Driver's License or State Identification which shows your local address. As a new applicant, you will always be required to have your prints taken. 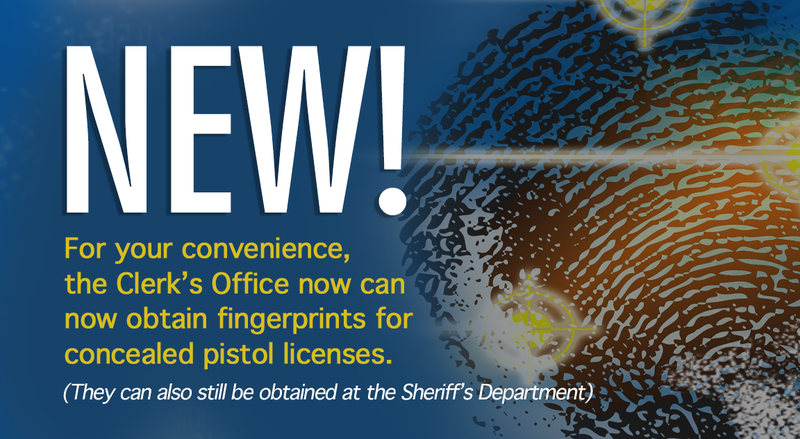 Fingerprints are now done in the County Clerk's Office at the time of filing your application. After the completed application and fingerprints have been electronically transferred to the Michigan State Police, they will perform a background check and respond to the County Clerk with a Qualified or Disqualified message. The County Clerk will send out an Approval letter with each Concealed Pistol License or a Disqualification Letter which identifies the disqualification reason, the disqualification source and the source's contact information. The County Clerk has 45 days from the date of fingerprints to send an Approval or Disqualification Letter for a new application and 30 days for a renewal application. If the application fails to get fingerprinted within the 45 days, the application is automatically withdrawn. Applicants may submit an application once during a calendar year.